You’re tired, you’re hungry, you’re not leaving your house. Story of my life, I totally get it. No judgement. In the off chance that you have leftover pulled pork from a lunch bbq excursion or in my case, a slow-roasted tenderloin sitting around (as we all tend to do from time to time) have I got good news for you! If you have the ingredients below, or get a second wind and make it to the store, you’ve gone above and beyond. If not, use the ones you do have to assemble a fantastic and super easy weeknight treat. Ingredients are as follows: kimchi, chopped onions, cilantro, lettuce, Sriracha, light mayo, lime juice, and small tortillas. If you want, throw in tomatoes, spinach, cheese, shredded carrots, avocado, you name it. Go crazy cleaning out that fridge. If you feel super motivated, heat up your tortillas in a pan. We’ve already established that you’re tired, so skip that if you want. 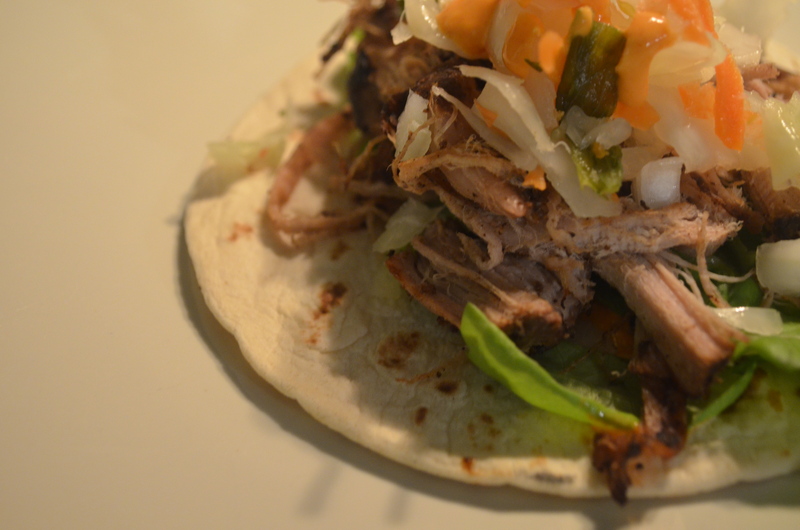 Whip up a little bit of Sriracha, lime juice and light mayo, (1-1-3 ratio respectively) and blob it on your tortilla. Reheat your pork. Then shred it apart if it isn’t there already. Layer it and the rest of your ingredients on the tort, and voila! Previous PostAdventures in Fish Town, Part 1Next PostPan blackened broccoli. Yum! Your name. Your voice. Your Style.